LAS VEGAS, April 17, 2019 /PRNewswire/ --INSIGHTS 2019 -- Epicor Software Corporation, a global provider of industry-specific enterprise software to promote business growth, today announced the release of its latest version of Epicor® iScala® enterprise resource planning (ERP) software. Featuring enhancements that will enable organizations to boost operational agility and accelerate competitive advantages, this new release contains improvements that elevate the functionality and usability of the ERP solution. These include a powerful new reporting architecture, integration with Epicor Data Analytics, and additional country and region-specific localizations which today's global organizations need to drive better business outcomes. "Epicor is committed to helping customers stay at the forefront of their industry by ensuring that every new release of iScala features value-add enhancements requested by our customers," said Andy Coussins, senior vice president, international at Epicor Software. 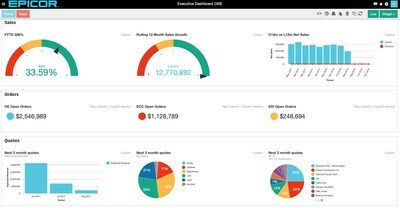 "In this release, we've put the focus on augmenting the usability, reporting, and business analysis functionality of iScala, so that customers can leverage more business intelligence, value, and growth from the platform." Integration to Epicor Data Analytics—helping companies turn their data stored in Epicor iScala into actionable insights. With a deeper understanding of business data, companies can grow by reducing cost, identifying new opportunities, supporting specific programs, and speeding up decision-making. With this release, Epicor continues to advance the capabilities of iScala to deliver the scalability, extensibility, and rich functionality SMBs need to optimize the running and management of their operations and integrate their processes with customers, suppliers, partners, and channels. "In use for over 20 years, iScala enables SMBs to reap the benefits of a cost-effective yet powerful multifunctional ERP platform that's been developed to support the very unique business dynamics of small and midmarket companies," said Nina Domingo, Director of Product Management. "Better reporting capability was a top customer request in the Epicor Voice of the Customer Survey in 2018 and 2019. Responding to that, and working in close collaboration with the user community, Epicor continues to move iScala forward in line with the needs of modern businesses seeking to thrive and survive in an increasingly competitive digitalized age." "The introduction of standardized reporting tools and the ability to include extended data from the iScala database will streamline our ability to create reports and documents from the ERP system," said Magnus Hanssen, global systems and security manager, HMS Industrial Networks. "All in all, we believe this release represents a great step forward for Epicor iScala." To learn more about Epicor iScala, please visit https://www.epicor.com/en-us/erp-systems/iscala/. Epicor, iScala, and the Epicor logo are trademarks or registered trademarks of Epicor Software Corporation, registered in the United States and other countries. Other trademarks referenced are the property of their respective owners. The product and service offerings depicted in this document are produced by Epicor Software Corporation.